…God is father, supreme father of everyone. If we simply study this verse from the Bhagavad-gītā, that the mother nature is the mother of all living entities and God is the supreme father of everyone… We can study these two lines very carefully. On the earth we can see so many living entities are coming out, beginning from the grass, then so many insects, reptiles, big trees, then animals, birds, beasts, then human beings. They are all coming from the earth, and they are living at the expense of earth. The earth is supplying food to everyone. As the mother gives life or maintains the child by the milk of her breast, similarly, the earth mother is maintaining all different types of living entities. There are 8,400,000 different forms of life, and the earth, mother earth is supplying food. There are thousands of elephants in the African jungle, they are also being supplied with food. And within your room in a hole there are thousands of ants, they are also being supplied food by the mercy of the Supreme Personality of Godhead. So the philosophy is that we should not be disturbed by the so-called theory of over-population. If God can feed elephants, why he cannot feed you? You do not eat like the elephant. So this theory, that there is a shortage of food or overpopulation, we do not accept it. God is so powerful that He can feed everyone without any difficulty. Simply we are mismanaging. Otherwise there is no difficulty. Prabhupāda: …served five thousand years ago at Kurukṣetra. In India there is still that place, Kurukṣetra, and religious men go there especially on the occasion of solar eclipse. So recently there was solar eclipse. Still, many millions of Indian population gathered there. Those who have gone to India might have seen this holy place, Kurukṣetra. There is a railway station also of the name Kurukṣetra, and it is a vast field. The Battle of Kurukṣetra took place also during Lord Kṛṣṇa’s time, and the Bhagavad-gītā is the product in the Battlefield of Kurukṣetra. So this ceremony…, Kṛṣṇa, with His elder brother Balarāma and His younger sister Subhadrā, visited in this chariot at Kurukṣetra, and we are observing this festival. Formerly one king of the name Indradyumna, he started the temple of Jagannātha in Orissa at Purī. Perhaps some of you who have gone there, they know there is a very, very old temple, according to modern calculation, not less than two thousand years old. There is the Jagannātha Deity. The King was very much anxious to establish a temple of Kṛṣṇa, Balarāma and Subhadrā, but there was a contract between the sculptor and the King that the sculptor would go on working in closed door and the King should not disturb him. But when many days passed the King felt, “What this worker is doing?” So he forcefully opened the door, and he saw that the sculptor could not finish the Deity. So this form of Jagannātha, Kṛṣṇa, Balarāma and Subhadrā, was unfinished. They were going under construction, carving, but the King forcibly opened the door. Therefore the King said, “I shall worship this unfinished Deity. Never mind.” So this Jagannātha you see in this form because King Indradyumna wanted to worship Him in that form. So this is devotee’s willing. Kṛṣṇa accepts everyone’s devotional service if it is offered with love and affection. 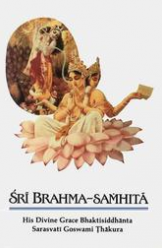 He says in the Bhagavad-gītā, patraṁ puṣpaṁ phalaṁ toyaṁ yo me bhaktyā prayacchati [Bg. 9.26]. Kṛṣṇa said “Anyone who offers Me a little flower, a little water, a little fruit, with love and affection, I eat them, I accept them.” So if something offered by you to Kṛṣṇa is accepted by Him, then you should know that your life is successful. So there is no question of offering God so many things very gorgeously prepared, but you can offer a little flower, a little fruit and little water with love and affection. That means even the poorest man in the world can worship the Supreme Personality of Godhead. There is no hindrance. Ahaituky apratihatā. Devotional service cannot be checked by any material condition. If anyone wants to worship God, he can do in any condition of life. There is no restriction. There is no restriction of cast and creed or country or nation. Anyone can worship the Supreme Personality of Godhead according to his means, and our, this Kṛṣṇa consciousness movement is a propagation to teach people how to worship the Supreme Personality of Godhead. This is our mission, because without relationship with God, without reviving our eternal affinity with the Supreme Personality of Godhead, we cannot be happy. The Vedic injunction is sarve sukhino bhavantu: “Everyone become happy.” We are actually struggling for existence to become happy, but we do not know how to become happy. So this science was taught five thousand years ago by God Himself. He advented in India. That does not mean He advented for India’s benefit. He claims… Actually that is God’s claim, that He is the father of all living entities. God is father, supreme father of everyone. If we simply study this verse from the Bhagavad-gītā, that the mother nature is the mother of all living entities and God is the supreme father of everyone… We can study these two lines very carefully. On the earth we can see so many living entities are coming out, beginning from the grass, then so many insects, reptiles, big trees, then animals, birds, beasts, then human beings. They are all coming from the earth, and they are living at the expense of earth. The earth is supplying food to everyone. As the mother gives life or maintains the child by the milk of her breast, similarly, the earth mother is maintaining all different types of living entities. There are 8,400,000 different forms of life, and the earth, mother earth is supplying food. There are thousands of elephants in the African jungle, they are also being supplied with food. And within your room in a hole there are thousands of ants, they are also being supplied food by the mercy of the Supreme Personality of Godhead. So the philosophy is that we should not be disturbed by the so-called theory of over-population. If God can feed elephants, why he cannot feed you? You do not eat like the elephant. So this theory, that there is a shortage of food or overpopulation, we do not accept it. God is so powerful that He can feed everyone without any difficulty. Simply we are mismanaging. Otherwise there is no difficulty. So under the circumstances we propose that every one of you become God conscious. The paragraph which I was mentioning, that we see the mother, mother earth, and we see the children in different forms… Then we must accept that there is father. Because without father there is no possibility of mother begetting children. If you simply understand this philosophy of father, mother and children, then you can very easily understand that there is God, the supreme father. There is no difficulty. But if you do not become reasonable as human being, if you remain as animal like cats and dogs… The dogs cannot understand that there is the supreme father, God, but a human being can understand. He has got intelligence. So with this advanced intelligence, if we do not understand about the existence of God, our relationship with Him and what is our duty in that relationship, then our, this human form of life will be spoiled. Our, this Kṛṣṇa consciousness movement is checking the human society from spoiling the human form of life. This human form of life, by the evolutionary process we have got after millions and millions of years, and if we spoil this life eating, sleeping, mating and defending like the cats and dog without any sense of God, then our life is spoiled. So please do not take this Kṛṣṇa consciousness movement as any sectarian movement. It is the science of God. Try to understand the science of God. We have got so many… (man yelling in background) What is that? Rādhā-vallabha: It’s a crazy boy. Prabhupāda: All right. Either you accept it directly or you try to understand through philosophy and science. We have got so many books. So kindly take advantage of this movement and impartially try to understand what is the purpose of this movement, why we are distributing so many literatures. Soberly and with calm head, try to understand this movement and be happy. That is our only mission.